Save money, energy and equipment wear and damage with a variable speed drive installed for your rod pumping unit! 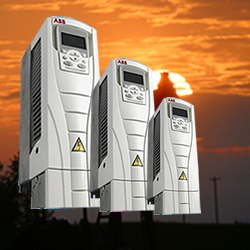 A Variable Speed Drive allows the user to infinitely control the speed of an electric motor with the push of a button. A Variable Speed Drive can also provide huge benefits for fluid transfer pumps. A variable speed drive(VFD) can provide a verifiable pay back on your initial investment through reduced energy usage. In addition, a VFD can have a significant reduction on the wear and tear of mechanical parts, thus providing even faster pay back on the investment. Our brand drives installed in our custom enclosures have proven to be extremely reliable. A Variable Frequency Drive on a rod pumping unit allows you to dial in the exact speed you want the drive to run, providing infinite control of a 1200 RPM motor down to 240 RPM. Can be used in place of a phase converter where 3 phase power is not available. A drive is much more efficient and provides for longer motor life than phase converters. Allows a unit to run continuously at a constant speed rather than starting and stopping the unit with a time clock. This reduces mechanical stress on the gearbox, rods, belts, etc. Slowing the speed of the unit reduces power consumption and demand factor.